Swimming is a low-impact form of cardiovascular exercise that is appropriate for most people. It uses muscles in your core, upper and lower body to move you through the water and raise your heart and respiration rate. The calories you burn during a swimming workout can help you lose weight and increase your muscle definition. However, swimming alone without resistance training and a healthy diet may not result in the muscle definition you crave. You can have a healthy body weight and healthy body fat percentage and not be considered "ripped." This term refers to low body fat that allows you to see more muscular definition. Healthy body fat ranges from 10 to 22 percent for men and 20 to 32 percent for women, according to the American College of Sports Medicine. A body fat range of about 14 percent for men and 12 to 20 percent for women can increase muscle visibility while keeping your overall body fat percentage in the "healthy" range per the ACSM. 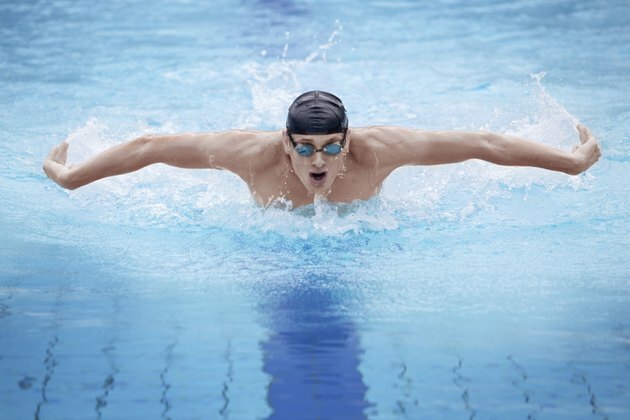 Regular sessions of cardiovascular exercise, such as swimming, are necessary to lower your body fat. ACSM advises five to seven sessions per week for 30 to 60 minutes to achieve significant weight loss. Intensity is also important and should be moderate to high throughout your workout. The exact number of calories burned during a workout depends on your weight, fitness level and the intensity of your workout. Swimming improves muscle tone slightly because the muscles are being used for the activity, but to really get ripped you also need to perform resistance-training exercises. These can be done with your own body weight, machines, free weights or resistance bands. If you are new to resistance exercise, start with one set of eight to 12 repetitions two to three times per week for each exercise you perform. Do one exercise for each major muscle group and rest at least 48 hours between sessions. Choose a resistance that is challenging but allows you to perform your repetitions with proper form. If you overeat, you won't get ripped -- no matter how much you exercise. To lower your body fat and lose weight, you need to eat fewer calories than you burn on a regular basis. To decrease your caloric intake and maintain healthy nutrition, choose whole-grain sources of carbohydrates such as brown rice or oats. Eat lean sources of protein such as poultry and fish and grill or bake to reduce added fat. Eat a diet that includes heart-healthy unsaturated fats like olive and nut oils, lots of fruits and vegetables and 64 oz. of water each day.